Eclectic Paperie: Peek into my 12 days before Christmas Journal . . . Peek into my 12 days before Christmas Journal . . .
Hello sweet friends, Tracy here today. 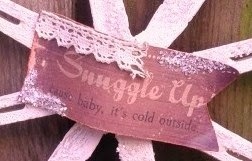 I hope you all had a very Merry Christmas and all looking forward to the New Year that is coming closer and closer! 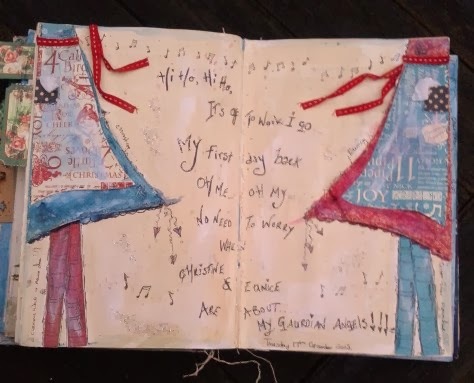 Before I share a little peek into my journal, I would like to thank Kim and Bonnie for being so understanding after my op recently, as well as all the fabulous ladies on the team . . . 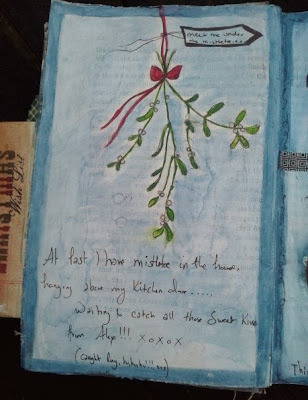 I haven`t forgotten you all I promise and I have loved seeing what you have all been creating. You may remember that I did a post a wee while back showing you the covers of my journal, well here is a peek into the first seven days . 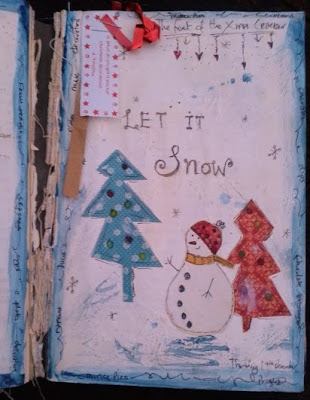 . .
First Day of Christmas . . .
. . . pretty Graphic 45 Papers & Stickers, Gesso, Chipboard, Pan Pastels . . .
. . . along with Simple Stories bits and bobs and Tim Holtz yumminess to complete the inside front pages. 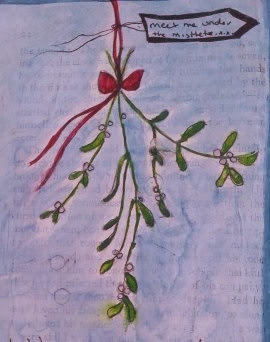 On the 14th December the mistletoe was hung ready to surprise the unsuspecting victims,lol! 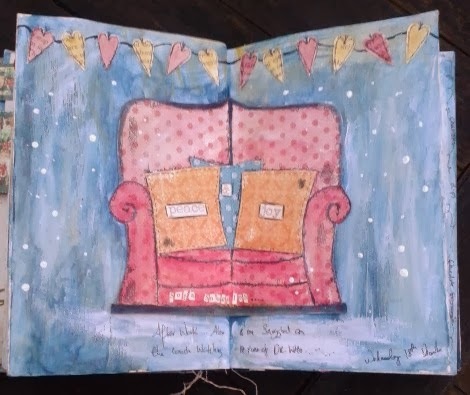 Each book page was given a swipe of Gesso, followed by a quick pencil sketch, adding the colour with Tim Holtz Distress Stains and watercolours. 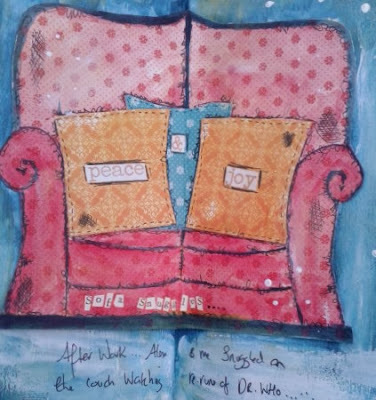 I love the way the products give the pages the feel of canvas . . . yumminess on a page! 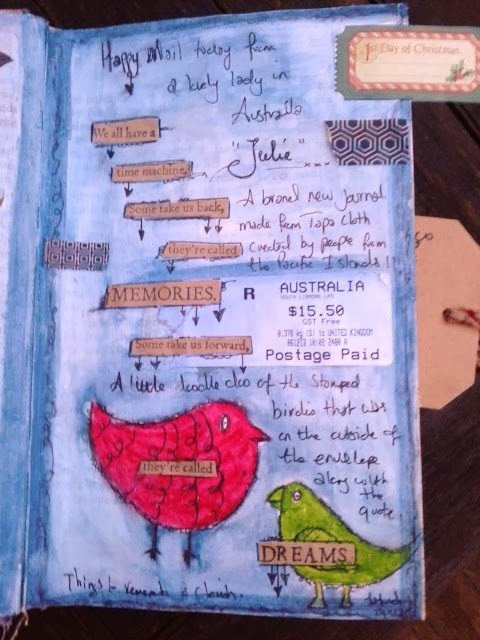 I received a beautiful stamped parcel that day from a lovely creative friend, who lives in Australia and I wanted to pop that memory into a page . . . sooooo out came the pencil to sketch the birds onto a page along with the recycled postage stamp, chopped up quote and some of the washi tape from the front of the parcel. December 15th . . . still not feeling up to doing what I would usually be doing and feeling frustrated with myself when Alex to the rescue!!! Besides our main tree I also have 3 small trees that I dot around the house and I really didn`t think I would have them out this year, when my lovely husband took it upon himself to decorate not one BUT all three trees. He really enjoyed himself plus it was a pleasure to watch him at work! Honestly . 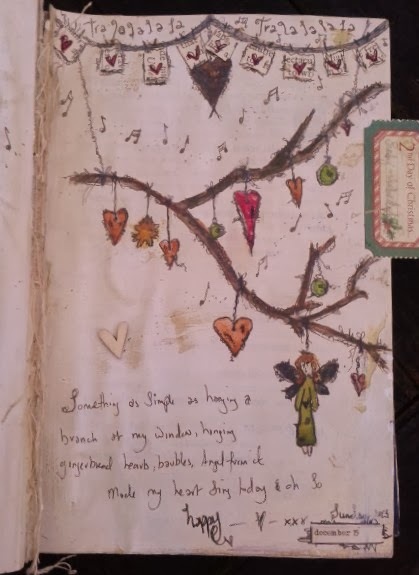 . . give me an old branch, hang it in my window, add a few baubles, hearts, a fairy and some homemade bunting along the window and I am in heaven!! My branch looks oh so very pretty, simple and so quick to transform a room. 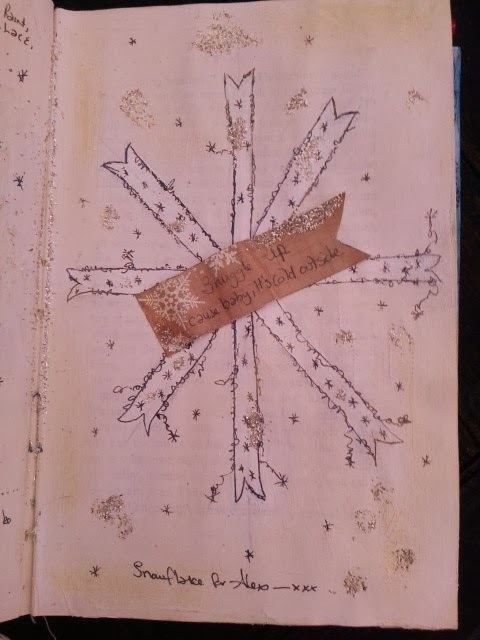 I wanted to record a little snowflake I made for Alex, it was the first thing I have made since my op and boy it felt good to be creating! 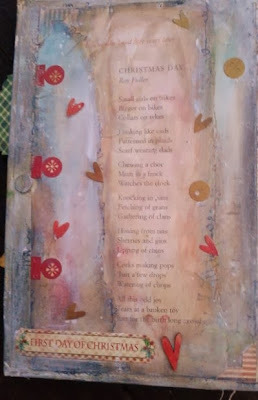 Gesso, sketching, stencil, Pan Pastel and a little German Glitter Glass . . .
. . . I wish you could see this page in real life the dazzle and twinkle from the Glitter Glass is so, so beautiful. December 17th - I went back to work and was terrified of hurting myself, but fear not I have two guardian angels who made sure I didn`t do anything that would set me back. 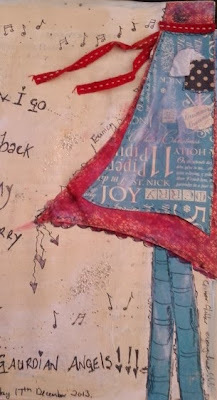 Out came the yummy Graphic 45 papers to make the dresses, apron and legs . . snip, snip, snip . . . before turning into . . .
. . . this with a little doodle doodle dooing and some inky paintiness and I had managed to capture how I felt. Sofa Snuggles . . . Okay, so I admit to having went back to work way too quick and finding it a daily struggle right now. How have I been spending my nights? Yep, snuggling in my housecoat on the couch next to Alex watching . . .
Got to love Graphic 45 pretty papers! Surprise picnic at work tonight . . .
Twas all quiet at the school that night . . . until I opened a door and stepped into a transformed room . 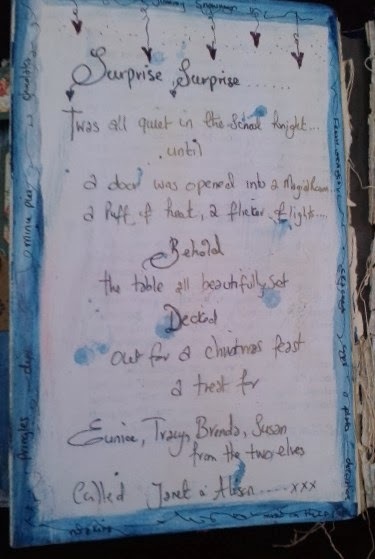 . .
a beautifully set table all decked out for a Christmas feast by two beautiful elves called Janet & Alison. 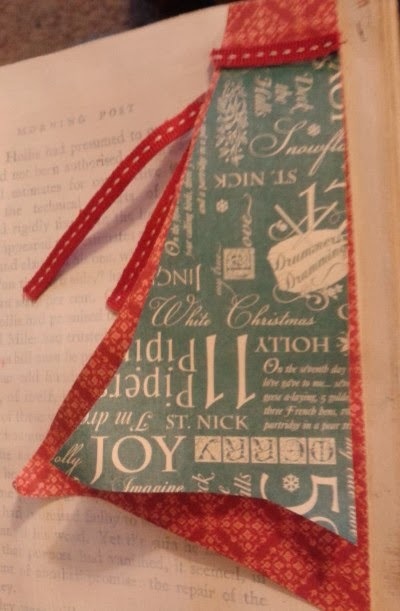 I went with the picture on the crackers to journal . . . a little bit snipping of the pretty papers again and some doodle doodle doings to record such a beautful heartfelt surprise. I fell by the wayside I`m afraid . . . last day at work in the school, not sure how I made it, but I did! 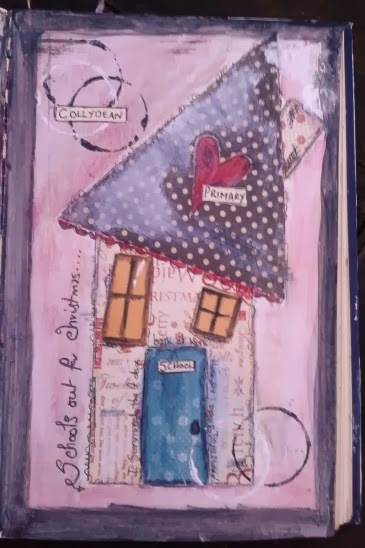 I managed to make a school from pretty papers, paint the background and add a few details but it`s not quite finished yet I`m afraid . . . 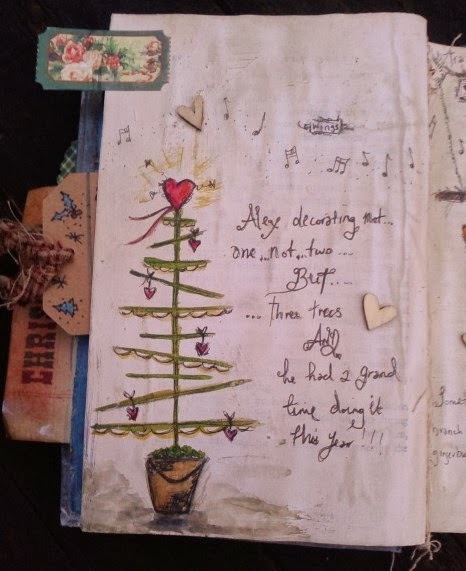 I have sketches in a notepad for the last of my days of Christmas and will be finishing it up over the next few days in my journal, along with pictures printed out and snuck away in hidden pockets along with a few recipes. It`s amazing what you can achieve with an old raggedy unloved book, pretty papers, Distress Stains and imagination! 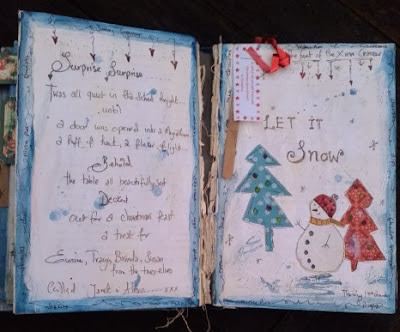 Have you journalled your Christmas memories? If you have then please let us know in the comments, we would love to see them. Tracy, it is beautiful! 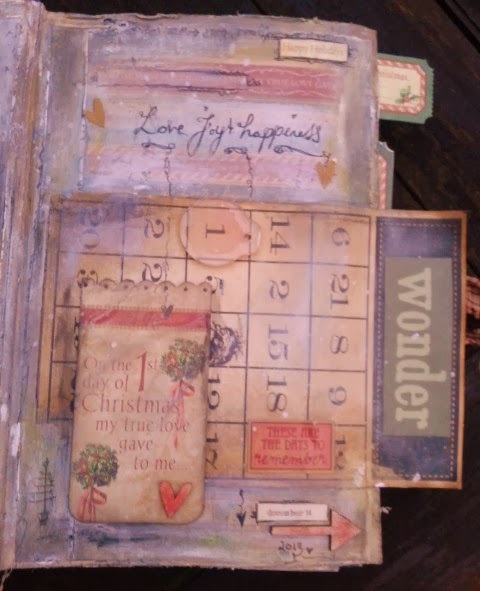 I love the idea of a Christmas journal, this time of year goes so fast and we often miss the details! 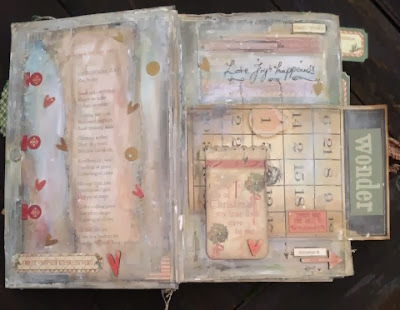 Your journal, keeps all those memories wrapped up! I love it! I too love the idea of the Christmas Journal as Karen said - it is very easy to miss the little details. I am so glad that my gift to you gave you pleasure. What a lovely way to remember it! The 3R's should be your mantra right now - Rest Recover and Restore ....You! Lovely collection of Christmas memories. 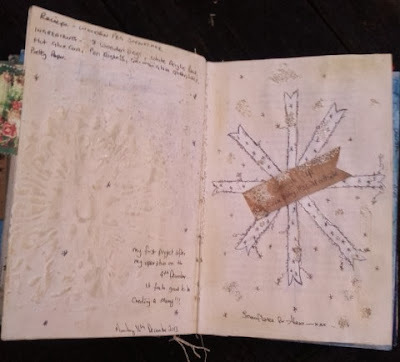 Tracy, this journal is just SPECTACULAR! Every page is a treasure. THX for sharing! Love, love, love this album... every page has its own delights - completely spellbinding!